Step 1 Preheat oven to 375°F. Step 2 In a medium bowl, stir together cottage cheese, applesauce, eggs, egg white, honey, vanilla and 1/4 tsp (1 mL) cinnamon. Stir in walnuts, raisins and cooked noodles. Pour into a greased 8-in. round pan. Step 3 Mix together remaining 1 tsp (5 mL) cinnamon plus brown sugar, and sprinkle evenly overtop. Step 4 Bake, covered, for 30 minutes or until set in the middle. Let rest, covered, for 30 minutes. Serve warm. 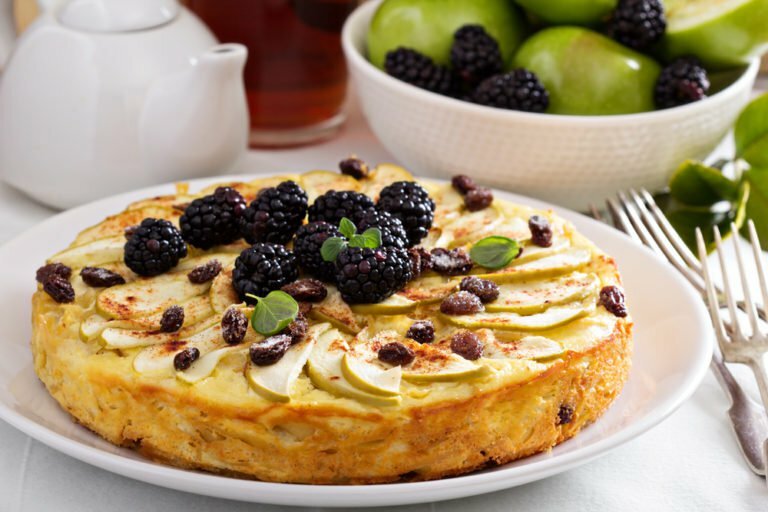 Kugel is a traditional Jewish dessert dish served on the Sabbath and festive holidays. This recipe includes nuts and raisins, but you can be creative and add your own favourites, such as bittersweet chocolate chips or dried cherries.